Homesteading is one of those things that just does not work if you don't have a plan. Part of that plan is setting goals. What do you want to accomplish on your homestead and what do you envision your homestead to be? The possibilities are endless, but you need goals and a plan! 1. Expand the garden. While you should always grow what you eat, consider expanding your garden to cover more of your personal food needs. I like making my own sauces so that is what I have been focusing on. However, I need to think of vegetables that will winter well in a root cellar too to provide more food over the winter. 2. Plant more fruit and nut trees. Part of homesteading is providing your own food needs and having more food-based trees helps do that. I know we need to add more pear and apple trees to our homestead as well as more elderberry bushes. We already have plenty of walnut trees, but I would like to look at other nut trees. 3. Consider expanding your livestock. If you have chicken layers, the next step might be meat chicks. Turkeys, geese, and ducks would also help add to your meat needs while being fairly low maintenance birds to have on the homestead. Maybe you are ready to take the next step for pigs or goats. Maybe the next step is a feeder steer or a dairy cow. On a homestead, the idea is to raise your meat and eggs. How can you do that? 4. Raise produce and livestock for profit. While running a homestead is great, cash flow to keep running the homestead helps with the stress. Whether you are selling eggs, selling produce at a farmers market, or raising meat for other people, that cash flow will help cover the cost of feed and other implements needed for the homestead. 5. What part of homesteading do you want to make simpler? Homesteading is about having a simpler life away from the modern consumerism of society. However, homesteading can be anything but simple. You should figure out ways to make your homesteading journey a little simpler and easier for you. 6. Learn new skills. What skills do you want to learn this next year? Butchering animals? Soap making? Canning? Dehydrating? Making lard or tallow? Sewing? The list of skills to learn can be endless, but find three that you want to learn and devote some time to it. Watch videos, read books and buy the supplies so you can practice and learn. The only way to fail at learning skills is to not start. 7. What would make homesteading easier? Is there a tool or a vehicle you want to purchase to make homesteading easier? Come up with a purchase plan or figure out a way to rent/borrow what you need to make your homesteading life easier. Backbreaking work is only fun for so long and then you lose interest. Personally, a four-wheeler with a trailer would be divine for our homestead this Spring! 8. Do you need to relocate? Are you an urban homesteader that wants to be a rural homesteader? Do you want to live in a different area? What would you need to do to make that happen? Some goals are meant for you to dream big and set a plan in action. If you are not happy where you are at, what do you need to do to give yourself the homestead of your dreams? 9. What projects do you need to tackle this year? Do you need to put up buildings? Build fence? Enlarge or fence in the garden? Fix or maintain buildings? The list of things to do can be endless on a homestead, but guess what? That list is a list of goals for you to attain and cross off! 10. Gather knowledge. While homesteading is a lot of learning by experience, being knowledgeable about what you are doing helps greatly. Whether you are watching videos, reading books, or talking to/working with more experienced homesteaders, you should be constantly learning. 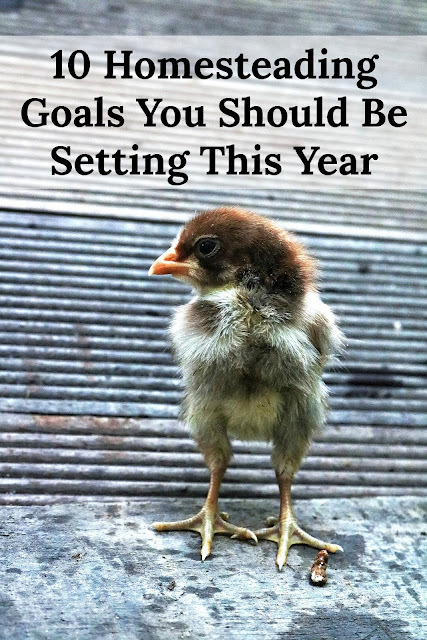 What homesteading goals do you want to set this coming year?